The talks in Berlin on October 19 seem unlikely. 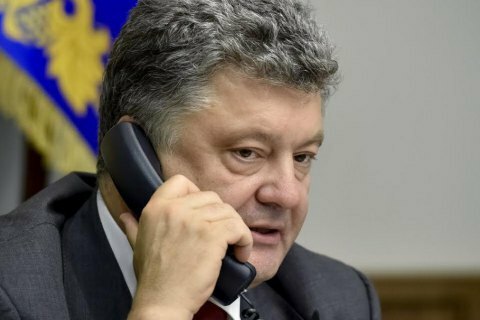 President Petro Poroshenko on Thursday, 13 October had a telephone conversation with French President Francois Hollande. The conversation was also joined by the diplomatic adviser to the German Chancellor Christoph Hoyzgen, who apologized that Angela Merkel was unable to take part. In addition, Poroshenko informed Hollande about the deterioration of security situation in Donbass, in particular an increase in the number of attacks by the Russian militants, including from heavy weapons. The Ukrainian president also pointed out the lack of permanent stations for OSCE monitors in the designated areas of disengagement. "The presidents of Ukraine and France have agreed on the special importance of the security component, which Russia fails to address and which should be the primary part of the road map for the implementation of the Minsk Agreements. The head of Ukrainian state said Moscow is blocking the process of releasing the hostages, which is totally unacceptable," the report reads. President Poroshenko thanked the delegations of Germany and France for the support of the PACE resolution on the need for preservation of sanctions against Russia. Poroshenko urged the EU to speed up the granting of visa-free regime for Ukrainians and ratification of the Association Agreement. On Wednesday, French government spokesman Stephane Le Fol said France would appeal to the leaders of "Norman Quartet" (Ukraine, Germany, France and the Russian Federation) to discuss the holding of a new meeting in Berlin. He said on Wednesday had to be established contacts with Russian President Vladimir Putin and Germany's Angela Merkel, and with Petro Poroshenko on Thursday, "to try and move forward in the search for a political solution" of the conflict in eastern Ukraine. On Tuesday, the Russian Ambassador to France Alexander Orlov said that German Chancellor Angela Merkel has invited the leaders of "Norman Quartet" for dinner in Berlin on 19 October. Petro Poroshenko's office said they did not receive an invitation to a meeting. They added that the president did not take part in it if the topic of the talks will be the political clauses of the Minsk Agreements. Ukraine's stance is that first and foremost, a "road map" to cease attacks must be adopted and only then parties may discuss the elections and the special status of Donbass.